Daphna Attias is Co-Artistic Director of Dante or Die and directs their 80’s inspired show Take On Me which is being staged in various leisure centres around country. It follows the company’s previous critical successes of bringing theatre to unusual spaces, with work including, their most recent hit in Edinburgh of User Not Found performed in a cafés around the UK, I Do a play about Weddings performed in the Hilton Hotel, Handle With Care was staged in Storage Unit. Take On me will feature a cast of professional actors alongside local members of the community who will be taking on various roles in the show. Take on Me is heading out on tour, what can you tell us about it? The show is set in the 1980’s and is a surreal, funny and poignant homage to 80’s movies and music and the fitness fads of that decade. It explores body image, loneliness and being true to yourself by channelling Jane Fonda, the Karate Kid and Whitney Houston! You arrive at a leisure centre after closing hours and are given a red or blue headband. Sequin-clad musicians arrive signing Take On Me and communicating through British Sign Language to lead you on a journey through the changing rooms, an aerobics class, the gym and finally, the pool. You dip into the inner worlds of our two protagonists on a day when their lives change: a woman in her 60’s who’s recently lost her husband and a lifeguard battling a hidden secret. At every location, we’re joined by an incredible guest cast who play a variety of characters. They’ve been working with some of two of our artistic team over the last few weeks in preparation. It’s touring to Leisure Centres, where did that idea come from? Take on Me began life after we visited an 1980’s leisure centre in East London that was being closed down and demolished. We became interested in this very democratic space that invited every part of society into the building – from babies swimming for the first time to older people who’ve been ordered by their GPs to do some exercise to gym buffs and aqua aerobics groups. These spaces are melting pots of people getting their heart rates going, striving for ‘better’ versions of themselves, to look better, to feel better. To create the production in 2016, we worked with the brilliant writer Andrew Muir and our Associate Artist Anna Richmond. We spent weeks talking to staff members, body-building weight-lifters and young mums in trampoline fitness classes. We sweated our way through spinning classes, chatted with the cleaners, danced in squash courts and fell into pools. We met a man whose introduction to the sports centre’s aerobics class helped him to come to terms with his sexuality. The more time we spent in leisure centres, the more it became clear that these buildings foster communities and enable people to connect with others – to make friends, as well as keep their bodies in better shape. This inspired us to create a production that included people from these communities within the performance, creating roles for different people to take part. Andrew’s script keeps this at its heart – as well as his love of 80’s films! How will local members of the community get involved? There are loads of different ways that local people will be involved. Some of them will be playing key parts in the show like the leisure centre receptionist or Tom Cruise who turns up unexpectedly. Everywhere we go, a local choir sings Holding Out for a Hero in the pool. 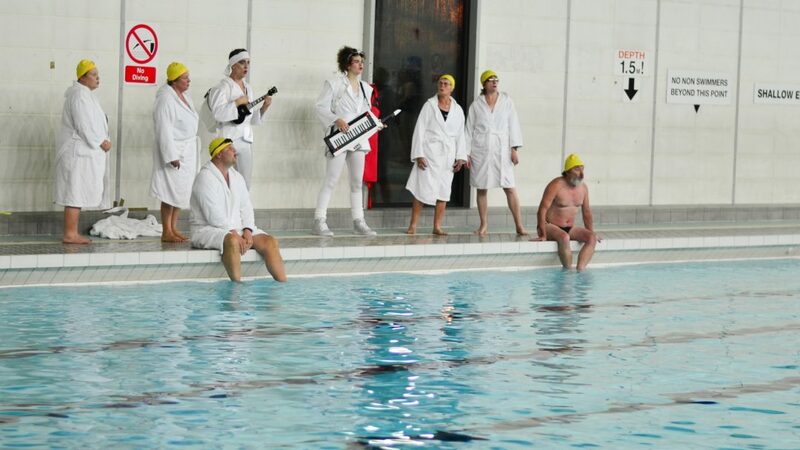 There’s an aerobics scene in which people can get involved to do a slow-motion aerobics routine. There are also roles for people who want to learn about site-specific theatre, assisting our stage managers, helping with costume, ushering the audience through the different spaces or designing make-up and hair for the different characters. We’ve recruited local Project Co-ordinators at each location who have been doing an incredible job getting the word out. The curtain call will be epic! How would you describe the live musical score? Joyous! We have two angelic musicians playing a keytar and a ukulele, along with a singer who is communicating through British Sign Language. They have created new versions of 80’s classics that underscore the narrative and add resonance to each moment. As well as the pop hits like Flashdance and George Michael’s Faith there are versions of Bruce Springsteen’s Dancing in the Dark and Joy Division’s Love Will Tear Us Apart. Our musicians are incredibly talented. Ellie Isherwood’s alter-ego is BYFYN, who regularly performs her own electro-pop across the country. George Hicks is a charming cabaret performer known for his Lord Hicks act. Sophie Gunn was one of our guest cast members in 2016. She’s worked with us as an access associate over the last year and a half, creating captioning for our production of User Not Found. We’re so delighted to have her communicate through BSL and add her beautiful vocals to the musical score. What are the challenges of staging a production like this? The creation process was the most challenging we’ve ever encountered. It was incredibly rare to have any exclusive use of space within the leisure centres. I remember that our first dress rehearsal took place whilst the centre was open to the public. We couldn’t use the dance studio because there was a timetable miscalculation so we were doing our aerobics class in the corridor with people walking through us as loud pop music blasted through the speakers. It’s a good way to understand how to focus with distractions! A fascinating challenge, it also meant we could continue to chat with people using the leisure centre as we made the show. We had to learn how to best open conversation in a busy gym whilst we worked the cast to choreograph a sequence on treadmills. We found ourselves explaining to a gentleman having a shower that the woman playing the strange looking keytar was rehearsing for this weekend’s performance and would he mind if she sang whilst he got dressed? Not your usual rehearsal room for sure. What would you say to anyone to encourage them to come along and see Take On Me? Take On Me is unlike anything you’ll see on telly or at the cinema. You get to be up-close and personal on a wickedly fun and unexpected journey. Plus there’s headbands, legwarmers and 80’s songs to sing along to. Why wouldn’t you come along? !